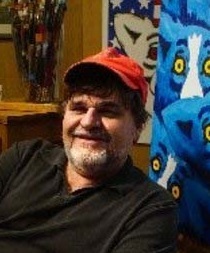 George Rodrigue (born March 13, 1944) is a Cajun artist who grew up in New Iberia, Louisiana. Rodrigue began painting outdoor family gatherings framed by moss-clad oak trees in an area of French Louisiana known as Acadiana. Rodrigue attended the Brothers of the Christian Schools all-male high school called St. Peter's College, (now Catholic High School) which was located near St. Peter's Church, and on the banks of the Bayou Teche as it runs through New Iberia. He studied art formally at the University of Louisiana at Lafayette (then named the University of Southwestern Louisiana) and the Art Center College of Design in Los Angeles. He later trained in New York, and became well known for his abstract expressionism of Cajun subjects, inspired by his roots. Rodrigue’s early notable works include The Aioli Dinner and Three Oaks. His most famous works include the Acadian heroine, Evangeline, portrayed in Henry Wadsworth Longfellow’s epic poem, Evangeline: A Tale of Acadie (1847) and the Cajun modern-day Evangeline, Jolie Blonde. He also designed three posters for the New Orleans Jazz & Heritage Festival, which feature portraits of Louis Armstrong, Pete Fountain and Al Hirt. Between 1985 and 1989, Rodrigue painted the Saga of the Acadians, a series of fifteen paintings chronicling the Acadian journey from France to Nova Scotia to Louisiana and ending with the official return visit to Grand Pré. More recently and worldwide he is known for his creation of the Blue Dog series of paintings, featuring a blue-hued dog, attributed to his deceased dog named Tiffany and influenced by the Loup Garou legend—the first painting in the series bears the title Loup Garou. The Blue Dog was made popular by Absolut Vodka in 1992, when Rodrigue was honored as an Absolut Vodka artist, joining famous artists such as Andy Warhol and glass artist Hans Godo Frabel. The Blue Dog was used by both Absolut Vodka and the Xerox Corporation through national ad campaigns. The blue-hued, ghostly spaniel/terrier is often featured with a white nose and yellow eyes. His symbol helped coin the term Blue Dog Democrat, which refers to a conservative member of the Democratic Party. Rodrigue has galleries in Aspen, Colorado; Carmel, California; Lafayette, Louisiana; and New Orleans, Louisiana. He was awarded an honorary doctorate at the University of Louisiana at Lafayette on May 17th 2009.